Rob Walker decided that Stirling Moss would achieve most in 1960 with a Lotus 18 and so switched from Cooper to Lotus before Monaco. Ferrari had also made changes having bought a Cooper and then built a car incorporating some of the ideas. The new car, called the 246P was to be raced by American F1 new boy Ritchie Ginther, while Scuderia Eugenio Castellotti ran the Ferrari-Cooper for Giorgio Scarlatti. Also new were two Scarab F1 cars for American millionaire Lance Reventlow and his engineer Chuck Daigh. Moss took pole by a second with Jack Brabham's Cooper and Chris Bristow's BRP Cooper alongside, while Jo Bonnier shared the second row with Tony Brooks's BRP Cooper. At the start Bonnier took the lead with Brabham second and Moss third ahead of Brooks and Bristow in the BRP Coopers. Moss took Brabham on lap five and then shadowed Bonnier until lap 17 when he took the lead. Further back Bristow went out with gearbox trouble. Brabham passed Bonnier on lap 20 but the Swede fought back and on lap 27 retook the position. The pattern of the race was turned upside down when rain came. 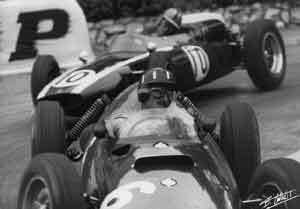 Brabham passed Bonnier and Moss to take the lead while Brooks spun back down the order, leaving McLaren in fourth place battling with Phil Hill. After six laps in the lead Brabham spun into the wall at Ste Devote and Moss was back in the lead but he had to pit to replace a plug-lead and so Bonnier was back ahead until Moss caught him. Bonnier went out soon afterwards with a broken suspension and G Hill crashed. This meant that McLaren finished second with Phil Hill third and Brooks the only other survivor. Others brought out their damaged and broken cars at the end in an effort to get World Championship points.